The closure of the HEA Subject Centres last year left a yawning gap in discipline-level support for teachers in Higher Education, although the HEA have been working hard to rebuild support in a different way to match the new funding model they now work to. One positive piece of news which emerged earlier this year, though, was their plan to hold a number of larger conferences to cover the broad discipline bases. For Arts and Humanities, this was to take place in Glasgow over the (very sensible, as it allows easier transport there and back) 24-hour lunchtime to lunchtime model. 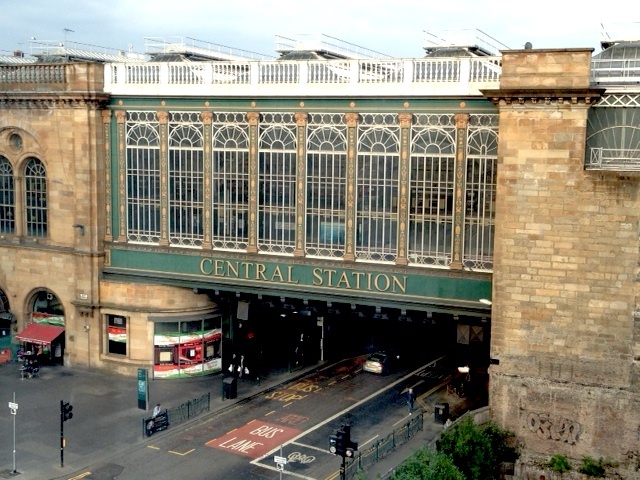 It’s the third time I’ve been to Glasgow, and I’m always impressed by its dark brooding grandieur and cultural buzz: the central train station embodying this in its massive newly-cleaned roofspace, dark-wood booths and cultural melieau. The conference took place in the equally impressive (in a new shiny way) Radisson Blu hotel, mere steps from the Central Station: which provided a comfortable, well-catered home for us over the 24 hours. The conference was topped and tailed by two keynote speeches – with a number of parallel sessions and workshops in between. There were some discipline-focussed strands (eg. all papers dealing with English, or Psychology) and some interdisciplinary, but in practice all sessions had relevence for everyone, as they featured broad themes resonant to us all, regardless of discipline: employability, research skills, assessment, course design, the Key Information Set, and others. More useful still, throughout all the sessions I attended – and in the coffee and lunch breaks – there was a genuine collegiate feel across questions, discussions and conversations: regardless of discipline base, we were all keen to help each other come to terms with key issues and collectively arrive at possible solutions and models. The second keynote was a beautifully presented history of art and design education by Linda Drew. Whilst also focussing on creative arts (it would have been nice to have one keynote on the literary or historical humanities), Linda provided a fascinating narrative, and urged us to focus on the needs of the future, where students should be allowed to think for themselves, teachers should become learners, and we all move forward together. This message carried on a fascinating theme from one of the parallel sessions earlier in the conference: allowing students to create work which cannot be wrong, or alternatively: freeing them from the pressure of wanting to be right. Lesley Coote, from the University of Hull, had asked her medieval literature students to create top trumps cards for the main characters in Chaucer: giving them numerical ratings on various ‘skills’, and then justifying them with a paragraph or two. Elizabeth English and Robert Eaglestone (Royal Holloway), with their literary theory students, had asked them to create journals – encouraging them to link their experiences on the (difficult) course topics to real life elements such as films or television. The journals were not marked, but encouraging or interested comments were added by the tutors. In a creative workshop on the final day with Nicholas Monk (University of Warwick) we were asked in teams to organise a set of images, quotes and statistics around capitol punishment in any way we felt meaningful: all three of the groups produced very different narratives within their layouts from the same materials. In all of these cases, students were provided with an activity which had no right or wrong answers – each was allowed to choose and develop their own take on the activity. And in each case, the students were highly engaged, and appreciative, of the courses. each group created their own group work contracts, which bound each member to particular requirements and avoided individuals letting down a team. Julie Raby (York St. John) presented some very useful data on patterns of online and offline ‘attendence’ (/access). Contrary to the usual accepted belief, Julie found that exactly the same students who attended and engaged in face to face sessions were those who also engaged with the online materials/activities; conversely those who failed to attend face-to-face sessions also ignored the online resources. She also found that her students much preferred a flat, linear structure to the online materials on the institution’s VLE: organised by session, and including clearly labelled lists of readings, resources and activities in order of importance. Any use of folders or alternative organisation was rejected as more confusing. For my own part, I enjoyed a thoroughly responsive and engaged audience for my workshop on the use of puzzles to set authentic contexts and teach research and other core skills/concepts. Overall, this was an excellent first combined conference. Any disciplinary differences were laid aside for 24 hours of collegiate, engaged discussion and shared problem-solving. Helped by the vibrant Glasgow surroundings, we all went our separate ways at the end buzzing with new approaches and a sense of hope in an increasingly challenging environment.